The international literature frequently presents optical techniques suitable for a massive testing of valuable paintings. The still open problem seems to fit perfectly the potentialities of IR thermography. Unfortunately, results are not fully satisfying, mainly due to the limited reliability and the lack of a standardised procedure. Nevertheless, a review of the more recent algorithms dedicated at the Thermal Non Destructive Testing and Evaluation shows the enormous progress of this method and the new features of modern equipment. However, even if it is a matter of direct observation in some fields, as aerospace, this progress is not found in works of art. The main reasons are strict bonds and unevenness typical of this application field. Analysing different reports of specialised journal, a completely new deal seems mature. Nowadays, mathematical modelling of the involved thermal problem supports a quantitative and precise testing and evaluation of extended fresco surfaces. The state of the art indicates direct use of simulation in optimising the testing procedure. Furthermore, the solution of the direct problem allows setting up the function needed for the characterisation of defects. In this paper a totally new approach is presented, where thermal modelling allows automating the data processing, improving results. For several years, we have been studying peculiarities of detecting defects in real historical frescoes in situ, using also realistic specimens at controlled lab environment. References and theoretical bases are given on detecting defects that are located at different depths, having different sizes. All achieved results are reported together with limiting factors, mainly due to the painted surface. Up today, in Thermal Non-Destructive Testing, all existing algorithms of data processing do not take into account 3D heat diffusion phenomena. In particular, lateral heat conduction generates false alarms and artifacts when data are processed by means of algorithms implementing a simplified 1D model. In this study, an adaptive procedure is proposed to dynamically process experimental data. 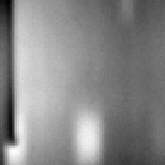 According to it, artificial image sequences giving the thermal evolution of sound materials are computed, starting from initial experimental conditions. The usefulness of this approach is demonstrated especially for the characterization of defects buried on fresco, where surface clutter is especially significant. A fresco has been modeled with a multi-layer slab. The numerical scheme implemented has enabled to simulate processes of dynamic heating. Experimental results are reported on plaster specimens containing a few artificial defects at different depths and tested with alternative optical NdT method. A tomography of the fresco is obtained under fast transient thermal state. During the last decade, Infrared Thermographic Non-Destructive Testing (TNDT) has become a powerful tool in the evaluation of materials. The background to recent achievements in this area was twofold. First, a new generation of fast snap-shot mode infrared cameras has entered the market that, in conjunction with short-pulse powerful radiating heaters, enabled studying fast thermal events and particularly in metals [1,2]. Second, considerable success in developing data processing algorithms, to merely mention defect characterisation by dynamic thermal tomography and pulse phase thermography [3,4], has allowed attaching to TNDT some quantitative features. On practical level, the efforts in developing frontier hardware and software are intended to enhance a signal to noise ratio (S/N) as a common figure of merit in non-destructive testing. However, surface clutter due to variations in sample optical properties still remain the major source of false indications when analysing inspection results and making decisions. For instance, in spite of several proposed techniques intended to solve the emissivity problem, black painting is the common way to diminish surface noise. This strongly reduces the attractiveness of TNDT for practitioners. Moreover, black painting is not a remedy against those noisy patterns that appear because of uneven heating and other 3D heat transfer phenomena. where the superscript indicates a particular time, i.e. a thermogram in the sequence; "0" relates to the signal before thermal stimulation (typically it corresponds to room temperature) and "*" to the normalising image. Any image in a sequence without any defect indications could serve as normalising, but typically it is the image of the maximum specimen temperature, occurring at the end of heating (th). The term Uij(T,e,t) - Uij0(T,e) denotes the excess specimen temperature, that is normally assumed to be proportional to image distortion factors, such as e. Therefore, normalisation reduces influence of uneven heating and surface clutter on normalised image sequence . The main limit of the normalisation by eq. (1) is that it is a one-dimensional(1D) correction, i.e. lateral heat diffusion occurring through the thermal process is not taken into account. As a result, the boundaries between areas of different optical properties can be enhanced after normalisation. 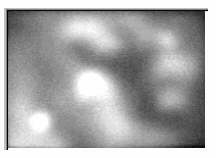 This phenomenon occurs in time and results in specific artifacts when time-domain algorithms, such as dynamic thermal tomography, are applied. We do not discuss here the problem of high-frequency noise enhancement arising when two noisy signals are divided each other, for instance by applying eq.(1). Notice that, since the signal spectrum of buried defect mainly contains low-frequency, the aim is the reduction of high-frequency noise. Theoretically, solving the three-dimensional(3D) transient heat conduction problem allows synthesising artificial image sequences that can be used to normalise source sequences, thus eliminating lateral heat diffusion phenomena. This paper contains the results of developing such an adaptive 3D filter and of its using in fresco inspection. The actual use of numerical methods suitable for this task and specialised for NDT is also discussed. The 3D Cartesian model to be analysed is suitable for TNDT applications (fig.1) because it is computationally effective. A three-layer body that contains several parallelepiped-shaped defects (only one defect is shown in fig.1) is heated on the front (F) surface. Both front and rear (R) surfaces exchange energy with ambient according to the Newton law. Furthermore, the imposed heat flux changes both in time and space as actually happens in real tests. The spatial profile of heating is determined with a Q-mask that is the node-based mask that specifies heat flux density in each surface point. The uniform, Gaussian-shaped or linear heating are three extreme cases common in TNDT. In general case, a time profile of heating is specified as a piece-wise function of time. However, in the practice the history of the heating may be described by functions as Dirac or square pulse, sine, periodical or not. Both specimen and defect thermal properties could be different in all three spatial directions (case of an anisotropic body). All side surfaces are adiabatic. Some model parameters, such as ambient temperature and heat exchange coefficients, could vary in time as user-defined piece-wise functions. on the boundaries between adjacent layers and between layers and defects. Here: K=N+M is the total number of all sample layers (N) and introduced defects (M); x,y,z are the Cartesian coordinates; qj is one of Cartesian coordinates; t is the time; Ti is the excess sample temperature in the i-th region; Ta is the ambient (initial) temperature; Ci and ri are the heat capacity and density within the i-th region; lqji is the conductivity within the i-th region by the qj-th coordinate; Q(x,y,z,t) is the absorbed heat flux power density; hF and hR are the heat exchange coefficients on the front (F) and rear (R) surfaces respectively. Eq. (2) is the 3D parabolic equation of heat conduction; eq. (3) is the boundary condition on the front surface that combines both heating and cooling; eq. (4) is the boundary condition on the rear surface (cooling only); eqs. (5) are the adiabatic conditions on the side surfaces (by x and y coordinates); eqs. (6) are the temperature and heat flux continuity conditions on the boundaries between sample layers and between layers and defects. The mathematical problem given by eqs. (2-6) has been solved by applying a finite-difference implicit numerical method implemented in a dedicated software from Tomsk Polytechnic University. processing the whole bunch of stored data with one algorithm for transient thermal NDT (see fig.2). the image taken at a optimum observation time when a class of buried defects are seen best of all. According to our experience, the dynamic thermal tomography algorithm gives good defect maps, linking the defect depth to the observation time . The obtained thermal tomograms manifest well the detachment between fresco plaster of 1-10 [mm] thickness, in case of more or less uniform fresco surfaces. However, strong variations in optical properties of fresco plaster, first of all uneven absorption due to varying colours, create artifacts that obscure visibility of subsurface defects. Normalisation typically applied to reduce uneven heating phenomena is helpful but does not solve the problem, because it is made with respect to only one image (typically the thermogram of maximum temperature). In real case, a heating pattern well visible at the end of heating is smoothing in time due to 3D heat diffusion that is not taken into account by conventional normalisation. where Ui,j(T,t,e) is the simulated sequence that corresponds to sample temperature in the absence of subsurface defects and u0, u* are computed images for the initial and normalisation time. Simply speaking, the subtraction technique deals with the normalised difference between experimental and simulated data, while the ratio technique is based on taking their ratio. The former is preferable when the thermal parameters and geometry are well known, allowing an absolute correction. The latter gives a reduction of the 3D heat diffusion effect. Fig.3 illustrates results of a preliminary numerical test using eq.8, where the case of two overlapping defects is studied. Two artificial sequences of 128 images each were computed by the 128x128, 12-bit format in order to simulate heating of two 40 mm-thick plaster samples during 30 s. One sample is sound and another contains two air-filled defects located at the depths 3 and 7 mm (the deeper defect is fully overshadowed by the shallower one). Both samples were subjected to simulated heating with the heat mask shown in fig.3a that was taken from an experiment made on a real fresco (the uneven heating is clearly visible). Noise of 0.1°C standard deviation was added to each image to simulate white noise of an IR camera. The image of fig.3b does not contain defects, it is a replica of the heat mask with some more noise due to lower temperature differences achieved during the cooling stage. Even the best image manifests only a vague indication of the two defects (fig.3c), becoming more visible after 3D normalisation (fig.3d). In addition, the sequence treated in such a way was processed by applying the thermal tomography algorithm . Two tomograms exhibit well both defects (see fig.3e,f). Note that the deeper defect creates the artifact in the tomogram of the shallower defect (black spot superimposed on the Defect #1 indication in fig.3e). This is a common drawback of any TNDT technique unable to discriminate fully between two defects that are located at different depths and partially superimpose in plane. However, that 3D normalisation suppressed another kind of tomography artifacts that typically appears as a crown-area around true defects. As a matter of fact, namely 3D heat diffusion phenomena were earlier blamed for this kind of artifacts [10,11]. Below we shall illustrate the potentials of the subtraction technique as having lower high-frequency noise to compare with results that come from division of two noisy signals. where Td and Ts are the mean temperatures in a sound and defective areas respectively, and ss is the standard deviation computed in a sound area, that is the noise. Defects #1 and #4 were pieces of sponge inserted between consecutive plaster layers, Defects #2 and #3 were air-filled voids. Furthermore a crack happens during ageing. Preliminary, defect characterisation has been made by using both thermal tomography and holographic interferometry techniques . The evaluated defect geometry is reported in table 1 for orientation purposes. The experimental procedure includes 30 s of heating and the storage of several hundreds of images having been recorded for 900 s. The computed sequence consists of 100 images each made of 272x136 pixel, that is the format of the used thermographic system. The thermal process was simulated implementing the implicit, finite difference method with a mesh of 50 in-depth nodes. Hence, the involved numerical grid was 272x136x50=36992 points, that has taken about half an hour of a PC computation time. Earlier researches have shown that air-filled voids can be reliably detected in plaster up to depth of about 3 cm, in case of quite uniform surface properties and slow-varying heating. The presence of a surface painting induces a strongly uneven thermal pattern and makes defect analysis unreliable. Darker areas absorb more energy and might look as defective (in thermal tomograms they create artifacts). Consequently, two identical defects located under a dark or a light area will produce different amplitudes signals. In addition, edge effects are given by the lateral heat flux. 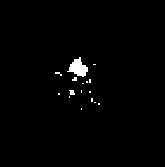 Both phenomena are well seen in the raw image of fig.4b taken at 270 s and regarded as one of the best in the sequence. 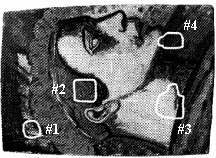 First, the area corresponding to the eye on the fresco, as well as the area between Defects #3 and #4, looks defective due to the darker colours. Then, Defect #2 appears quite bright because it is located in the highly absorbing area. The fusion of surface clutter and true defect indications is well presented with the maxigram in fig.4c. 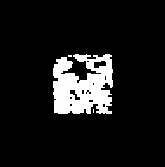 A maxigram is a special image that exhibits all image patterns at their maximum appearance, independent on time. This kind of images is used in thermal tomography along with a timegram that is the image where all patterns are presented by the time of their maximum appearance. A suitable threshold is applied to timegram to carry out thermal tomography. When implementing the 3D filtering technique, a raw image taken at 10 s was selected as a heat mask to calculate the artificial sequence. Processing by thermal tomography the filtered sequence, produce the maxigram shown in fig.4d, where the clutter is substantially reduced. Another comparison between a conventional technique and the 3D filtering is illustrated in fig.5. Here, binary images are created in order to simplify the analysis, where the defect extension is evaluated. 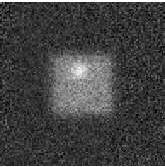 The conventional binary thermal tomogram still includes both defect indications and surface clutter, mainly appearing where darker fresco's areas are (see fig.5a). Meanwhile, 3D filtering allowed to obtain even two 'thinner' in depth tomograms, as reported in fig.5b and fig.5c, indicating defects much clearly. Advantages of 3D filtering have been demonstrated quantitatively by determining signal-to-noise ratio values. The statistical procedure included identifying four defect areas in the sites of the true defects with the rest of the image being regarded as sound. Then statistical parameters of selected areas were found and eq. (9) applied. The results are presented in Table 2 that clearly manifests advantages of 3D filtering as the technique enhancing the signal-to-noise ratio more than twice. Most modern thermal non-destructive testing (TNDT) techniques are based on the transient analysis of differential temperatures evolving in time over buried defects. Any quantitative estimates are possible if a reference point, i.e. the point that a priori belongs to a sound area, is selected. The temperature history in a reference point is strongly affected by the phenomena of uneven heating and absorption. 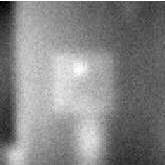 To reduce these phenomena, image sequences are typically normalised by a particular thermogram. Results of conventional normalisation become worse with growing time of analysis because of 3D heat diffusion that is especially significant on low conductive materials and non-uniform surfaces, such as painting. An adaptive 3D filtering operation (3D normalisation) is proposed to solve this problem. First experiences adopting a 3D filtering has shown that it is the physically clear instrument to take into account lateral heat diffusion in solids. With this technique, an experimental image sequence is normalised by an artificial image sequence, obtained as a result of numerical computation. This artificial sequence uses an experimental heat mask taken from the experiment and, as a matter of fact, predicts the evolution of a temperature distribution in a solid without subsurface irregularities. Input parameters are the material thermal properties, the sample thickness, and the heat distribution mask. Normalisation can involve both sequence subtraction and ratio, with the first technique being more suitable due to lower high-frequency noise. Deviations between true and accepted thermal properties do not destroy the algorithm benefit, as in case of true inversion solutions, but diminish the signal-to-noise ratio. In such a case the ratio normalising procedure is preferred to the difference one. In practical implementation of the algorithm it is important to keep a true ratio between geometric parameters of computed images in respect to source. The adaptive 3D filter by eq. (7) has been successfully applied to process results of the inspection of fresco being able to increase the signal-to-noise more than twice. Its main drawback is a relatively long computation time, but it could be overcome with growing computer power. The further improvements of the proposed 3D filter will involve more careful modelling of varying absorptivity and emissivity, as well as of non-linear heat transfer phenomenon. Y.A. Plotnikov, W.P. Winfree: Visualization of subsurface defects in composites using a focal plane array infrared camera, Proc. SPIE, Vol.3700, 1999, pp.26-31. V. Vavilov, E. Grinzato, P.G. Bison, S. Marinetti, M. Bales: Inversion for hidden corrosion characterization: theory and applications, Intern. J. Heat&Mass Transfer, 1996, Vol.39, pp.355-371.X. V. Vavilov, E. Grinzato and P.G. Bison: Thermal characterization and tomography of carbon fiber reinforced plastics using individual identification technique, Mater. Evaluation, May 1996, Vol.54, No.6, pp.604-611. S. Marinetti, Y.A. Plotnikov, W.P. Winfree, A. Bragiotti: Pulse phase thermography for defect detection and visualization, Proc. SPIE, Vol.3586, 1999, pp.230-238. E. Grinzato, P.G. Bison, S. Marinetti, V. Vavilov: Non-destructive evaluation of delaminations in fresco plaster using Transient Infrared Thermography; Research in Nondestructive Evaluation, Springer-Verlag, New York, vol.5, n°4, pp.257-271, 1994. E.Grinzato, P.G.Bison, C.Bressan, S.Marinetti and V.Vavilov, Active thermal testing of delaminations in frescoes' plaster, Proc. 4th Intern. Conf. on Nondestr. Testing of Works of Art, Berlin, Germany, 3-8 October, 1994, pp.357-366. E. Grinzato: Stato dell'arte sulle tecniche termografiche per il controllo non distruttivo e principali applicazioni; Giornale delle Prove non Distruttive Monitoraggio Diagnostica, AIPD, pp.25-40,1999. P.G. Bison, E. Grinzato, S. Marinetti, A. Braggiotti: Fresco thermographic inspection by convective heating technique; Review of progress in Quantitative Non-Destructive Evaluation vol.17 pp.1769-1776, Edited by D.O. Thompson and D.E. Chimenti, Plenum press, New York, 1998. E. Grinzato P.G. Bison, C. Bressan, A. Mazzoldi: NDE of frescoes by Infrared Thermography and lateral heating; Eurotherm Seminar n. 60, QIRT 98 Lodz (Poland), pp.64-67, 1998. V.Vavilov, X.Maldague and J.Picard, Dynamic thermal tomography: new NDE technique to reconstruct inner solids structure using multiple IR image processing, In: Rev. of Progress in Quant. NDE, ed. by D.Thompson and D.Chimenti, Vol.11A, 1992, Plenum Press, N.Y., pp.425-432.